In Summer 2012 I attended a PhD course on ’Climate Adaptation Policy’ in Reykjavik; rather apropos considering climate change has (and will continue to have) noticeable consequences for Iceland. Simultaneous to these consequences, Iceland has made efforts to reduce emissions (notably investments in geothermal energy). Still, per capita emissions remain high, specifically emissions from heavy industry, fisheries and transportation. In Iceland, the car is king. According to Iceland´s Fifth National Communication on Climate Change, “In 2007, Iceland had 666 passenger cars per 1,000 inhabitants, the third highest ratio among OECD countries” (page 20). In some ways, this could be justified: Iceland has a limited population (circa 320,000) and a total area of 103,000 km2 – the most sparsely populated country in Europe. While public transportation exists, Iceland does not have the density to justify an extensive public transportation grid. According to discussions with Icelandic friends, buses are infrequent, expensive with inconvenient route designs. Combined with a hilly topography, harsh weather conditions and sprawl, most Icelanders opt for the car – even if they live in Reykjavik. (200,000 live in the Greater Reykjavik Area.) In many senses, Reykjavik encounters the same challenges many U.S. (and other) cities face: a sprawling city which proves a nightmare for transportation planners. 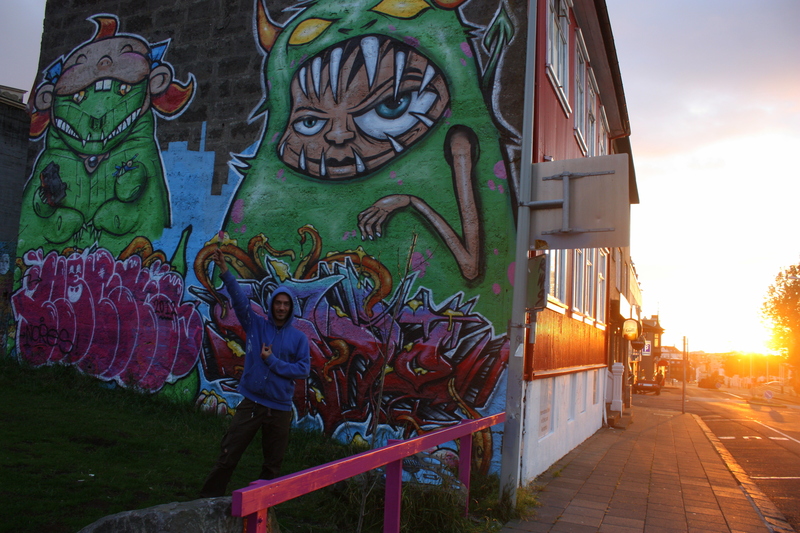 I point this out, not so much to be complacent in these common struggles, but instead to examine some of the creative approaches Reykjavik is currently undertaking. Mind you, my course focused on climate adaptation, so I do not pretend to be an expert in Reykjavik’s transport planning. Nevertheless, this sprawling city was the topic of conversations with visitors and locals alike. It is these conversations and my own daily observations upon which I reflect. The mayor of Reykjavik Jón Gnarr, a former comedian, jokingly promised many (sometimes outlandish) things for the city while running for election – some of which he actually meant, including better cycling. 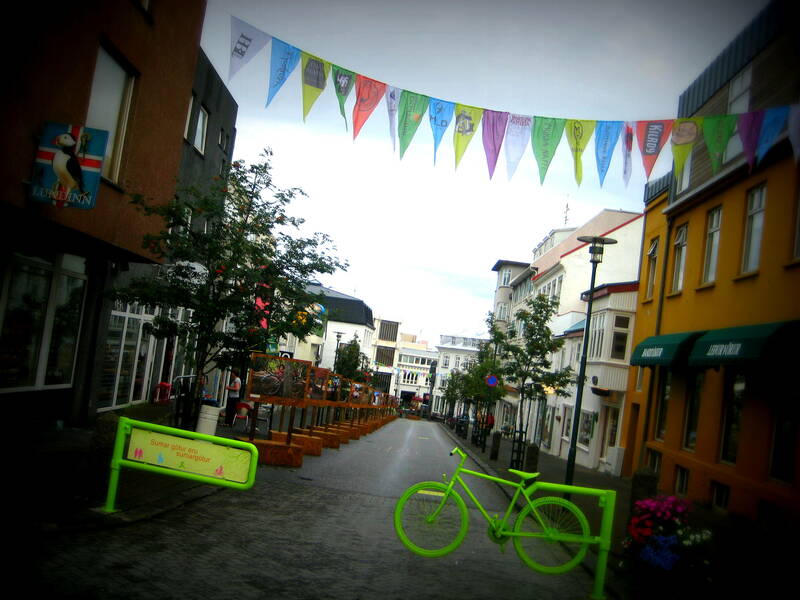 Throughout 2012, Reykjavik is investing some 13 million EUR to improve cycling infrastructure. In August 2012 Mayor Jón Gnarr and the mayor of Kópavogur (the second largest town in Iceland) signed a provisional agreement to look in to the possibility of a bridge between the two cities – designed specifically for bikes. While cyclists remain the minority, there has been a noticeable increase of cycle paths – and cyclists – in and around the city. In addition to structural investments, central Reykjavik has adopted a more creative approach: a dose of color, a promise of comfort or invoking curiosity – inviting pedestrians and cyclists to use the central city. 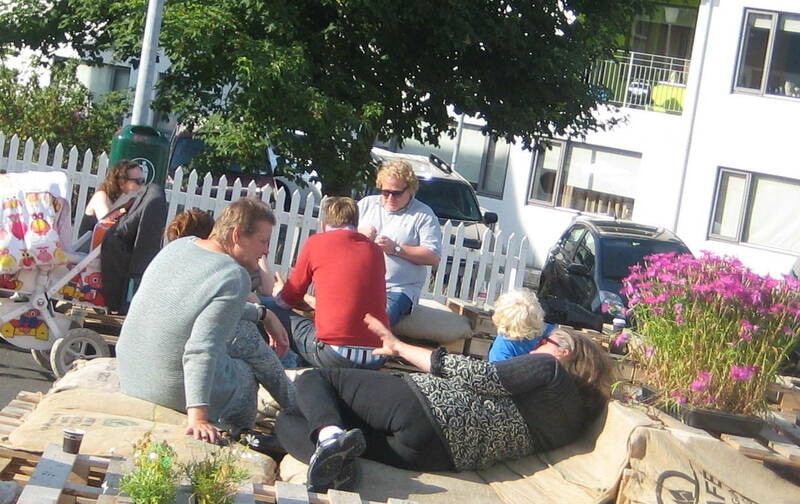 One group, ‘The City’s Reviewers,’ comprised of architects and art students, worked together with the local authority to test a new approach to parking lots: instead of parking cars, pedestrian parking – sunny spots to lounge, enjoy a coffee, rest, or people watch. This, combined with neon-green painted bicycles attached to metal poles, discourage (or even ban) cars from entering the city’s central streets. 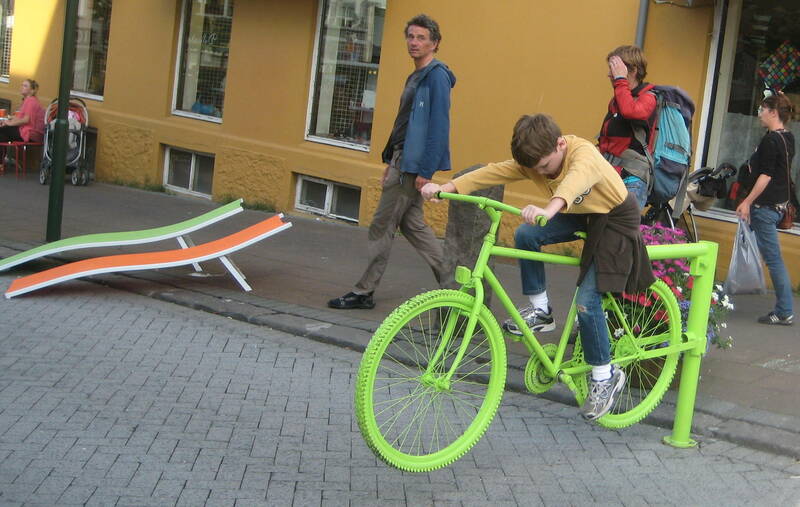 These neon-green bicycles were my favorite; not only for their photographic qualities, but how many children (and adults) jumped on the stationary bicycles to test them out. Parents, or friends, took advantage of the near-by street furniture to take a rest, or peeked into the closest shop corner – good for small doses of entertainment and for the stores in close proximity. graffiti skate-parks, a picturesque harbor surrounded by volcanic mountains, artisan shops featuring wool or pottery and café corners with painted walls featuring original (and random) designs. Many of these elements are more apt to explore by bicycle – or even better by foot – complimenting its current attempt to discourage cars in the city centre, and support slower modes of exploration. Reykjavik has a long way to go before it can proclaim to be a cycling/ pedestrian city. 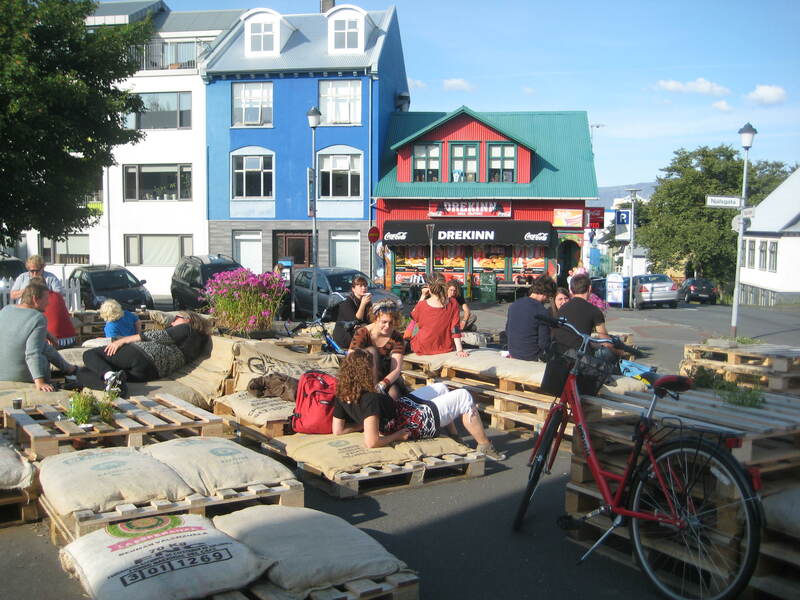 Similarly, many of these traffic-calming measures are undertaken (only) during summer months, with Reykjavik’s central streets opened to car traffic for the rest of the year. Evidently, its sprawling nature will continue to prove a challenge; but it has made initial steps. While most residents still opt for the car, there appears a certain enthusiasm for changes currently underway, with cycling slowly transforming from a sport to a sound method of transportation. Over time perhaps citizens will demand, or politicians provide, (even) better infrastructure to support cycling, walking or better public transport – or a combined ‘mobility management’ approach to all three. Here’s hoping. 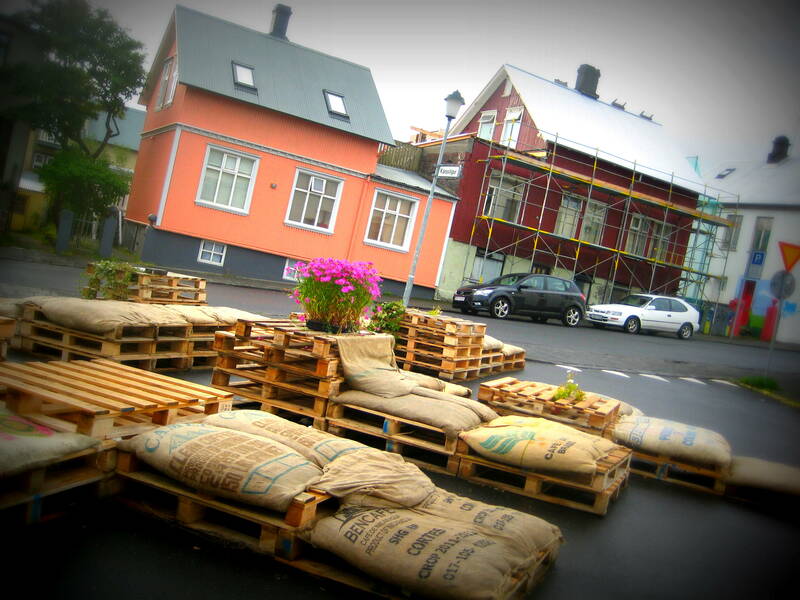 What Reykjavik encounters is a similar story to many cities, and its approach appropriate. It would not be a sound investment to foster a wide-scale (national) campaign for public transport or bicycling. In a country twice the size of Denmark, distances are long, with few people between – cars will remain part of the equation. However, the greater Reykjavik area represents over half of Iceland’s population and the central districts are attainable by bicycle. After a week in central Reykjavik, only on foot, I can vouch that this is also possible. Having so many people walking through the city is often good for local businesses – at least it helped persuade my purchase(s) of an Icelandic sweater, several souvenirs, as well as many a coffee or a beer. Transportation is but one sector contributing to Iceland’s greenhouse gas emissions, but an important one. What is currently underway in Reykjavik highlights the need for creative & multifaceted approaches combining several strategies, simultaneously, to effectively reach a particular goal – useful in both this island nation, and elsewhere. I will immediately grab your rss feed as I can’t to find your e-mail subscription link or e-newsletter service. Do you’ve any? Please permit me to understand in order that I may just subscribe. Thanks. Hi! I don’t have a newsletter; just write as I have time. 🙂 You can find me on twitter though @jenn_lenhart.